The bright and shiny new Southwest Centre for Forensic Mental Health has opened in St. Thomas with much fanfare and more than a few problems. The new building may “fight stigma,” as its proponents say, but a bowl of the cafeteria’s soup will cost a lot more for patients, staff and visitors and a glitch in the computerized security system is creating more than a few security headaches. Nor are there enough beds to facilitate the transfer of all eligible patients from the regional detention centre. The building is the first of two new privatized regional mental health facilities to open in the London area. During the June 14 opening ceremonies officials praised the architecture, noting it reflects a new level of respect for the hospital’s occupants. The second and larger of the two mental health hospitals will open in London for 2015. The two mental health facilities are being built as public-private partnerships, which means that in addition to the design and construction being provided by the private sector, 30-year maintenance and financing is also part of the deal. Facilities maintenance can include elevator maintenance, electrical and mechanical systems, ventilation systems and other similar work. After less than a week in the new facility — patients were not transferred into the building until June 19 — employees are already frustrated by the wristband system that is supposed to monitor and control the whereabouts of patients. Forensic patients are those who have arrived at the hospital following a tangle with the justice system. They have either been found unfit to stand trial, or the court has deemed them to be not criminally responsible for their actions. Contrary to the stereotype, more than 90 per cent of forensic patients are there as a result of non-violent incidents. The wristband system is supposed to reflect the individual restrictions placed on these patients by the Ontario Review Board (ORB). However, the new security system is allowing patients with much broader security clearance to bring their much more restricted buddies through doors they are not meant to travel through. Oddly, while this is possible, clinical staff are finding it difficult to go through the same doors when a patient with a restricted wristband is nearby. Further, patients are getting some surprising and likely unintended access, such as a group of patients found late in the evening in an enclosed outdoor courtyard. Some patients found their wristbands allowed them to wander into the offices of senior staff. The new building is supposed to look after the future needs of the community, but already it is at capacity. Only 80 of 89 beds are presently funded despite significant demand. The government has committed to another nine beds, but the funding will slowly trickle out over the next six years. That means many eligible patients are stuck in the nearby corrections facility rather than finding care in St. Thomas. It’s not like we didn’t warn them. OPSEU submitted its own report to the Southwest Local Health Integration Network in 2010 pointing out the planning was insufficient to maintain the status quo let alone provide capacity for the future. Much of the planning was based on out-of-date projections from the Health Restructuring Commission issued in the late 1990s. 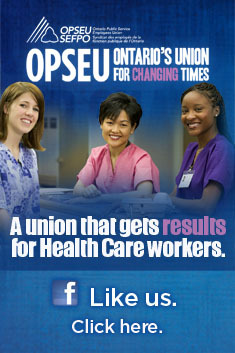 (To read our 2010 submission to the LHIN, click here). While technological glitches can be expected in a new building, there appears to be no explanation for a sharp rise in cafeteria prices following the move. Anecdotally we are told that many cafeteria prices are close to double what they were in the old facility. In addition to staff and visitors, many patients use their own money to supplement provided hospital meals. Compounding the malfunctioning wristbands, high food prices, and lack of capacity, the building is undergoing a not unexpected laundry list of deficiencies as elevators get stuck, doors fail to lock properly (including medication rooms) and issues are being raised about the safety of water temperature. Food services is experiencing its own problems as heated food carts cannot be plugged in close enough to the service belt lines where the trays are prepared. When the Royal Ottawa opened with similar problems in 2006, many of the issues were not resolved for more than a year and created conflict over whether the private consortium or the public hospital should be footing the bill for certain deficiencies. More on this issue to come. This entry was posted in P3 Hospitals and tagged Forensic mental health, London P3 hospital, Southwest Centre for Forensic Mental Health, St. Joseph's Health Care, St. Thomas mental health centre. Bookmark the permalink. I have come to the conclusion that human beings are progressively becoming dumber and dumber. This deterioration in our cognitive capacity began approximately 50 years age and is escalating expontentially. Seems we can’t even open a box of crackers anymore without it being a poop show. It is a frustrating issue when you believe there is mutual purpose of workplace employer and union to support safe working conditions. Bringing forth issues @ JHSC meetings to identify gaps,advance plans to change and implement the change is working with the internal process. So, when employers hear and change some issues, but other barriers prevent resolutions,it is my thinking this signifies poor faith. Emergency meetings must happen with recommendations given and minister ,if it is a potential for critical incidents than ministry of Labour Inspector should be called! The new Southwest Centre for Forensic Mental Health Care represents a major turning point in care. This new purpose-built facility means patients are living in, and staff practicing in, a new environment supported by new technology. Many of the issues are not solely facility issues, some are practice issues that have changed because of the change in environment. The new facility is an adjustment and will take some time and patience as people continue to acclimatize and become comfortable in understanding their new work place. St. Joseph’s leadership worked prior to opening, and continues to work on an ongoing basis, directly with the Joint Health and Safety Committee and OPSEU leadership to address any concerns. Issues have been resolved as they have been identified and it is important to emphasize that none of the issues identified to date have compromised the safety of patients or staff. In addition, St. Joseph’s has worked diligently with the union and staff to orient, train and address any questions or concerns related to the new technologies and the new environment. That is wonderful that the new facility boasts an architecture that is pleasing to the eye and some amazing ‘and costly no doubt’ computerized technology for arm bands and new technological access points for staff. Our public health care dollars hard at work while beds are decreased substancially in number, staff are downsized in number, jails are at capacity, the community supports are not receiving funding increases and for clients in need of some specialized mental health care….there is often ‘nowhere to go’. Regarding the post from management above this one….are you joking? Of course when access for patients to restricted areas and staff not being able to access spaces they need to provide care and people bringing in unauthorized friends to the building….it in fact does pose a significant safety hazard. Both to the staff and patients in the facility for care. Hopefully you do work efficiently and diligently to remedy the fancy new arm bands and staff security access bands before something happens to one of the staff or one of the patients. Shameful to implement this without testing to ensure the new fancy and costly technology works for the health and safety of all concerned.